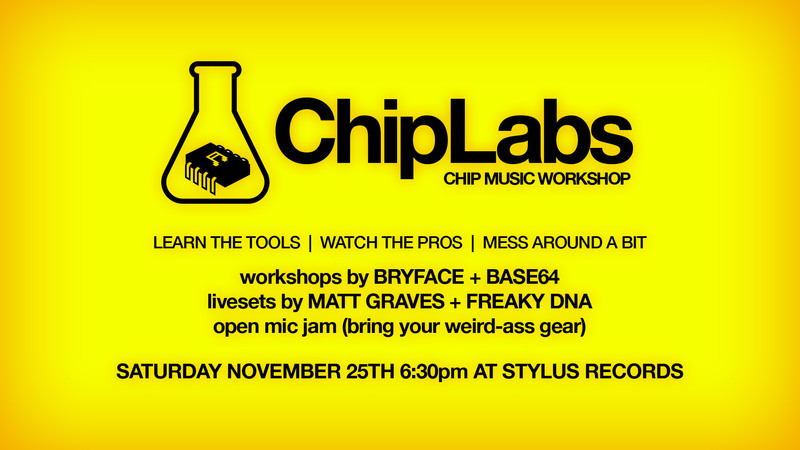 Vancouver chipmusic society brings you the next edition of ChipLabs – an ongoing workshop series dedicated to sharing knowledge about creating chiptunes and other low-bit artforms. This time around, you’ll learn how to make music using a Game Boy! 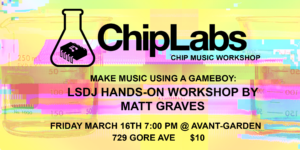 One of our members MATT GRAVES will be teaching the basics of Little Sound DJ (LSDJ), one of the most popular pieces of software for making chip music today – it turns your Nintendo Game Boy into a powerful music sequencer and synthesizer. All attendees will be getting hands-on experience with LSDJ via specially-prepared Game Boy handheld units, along with Cheat Sheets and other quick references. You’ll get the opportunity to start writing your own tunes, and even showcase your results to the room towards the end of the workshop if you’re feeling brave enough! You’d be shocked at how quickly you can get cool results. This edition will be held at Avant-Garden, a cozy new creative space situated in Chinatown on Gore Ave. We only have a LIMITED amount of seating, so get your tix fast! 9:30 PM Show off what you made! Hangouts! Q&A! – Their own headphones (with a 3.5mm jack). – a Windows or Mac laptop, or an Android phone, to run a provided emulated version of the software in case we run out of Game Boys for people to use.